I just love summer and fresh vegetables. 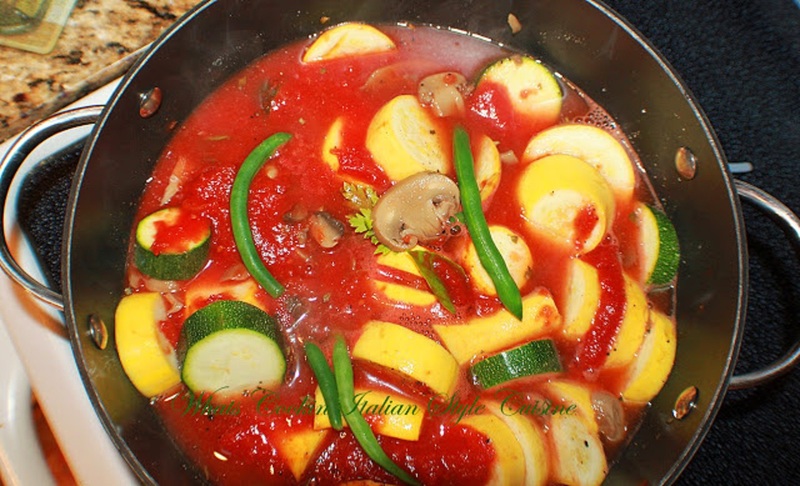 The greatest reason to make this pot of only vegetables in this stew, the sauce is great to dip your bread it! However it makes a fabulous topping for pasta, rice and for meat lovers you can add any meat you like. I personally eat it just the way it is. It's perfect. When growing up we had a huge garden in #UticaNewYork, my dad always provided us with fresh vegetables all summer long, this dish reminds me of dad. Miss those days. Note: you can use a slow cooker at the simmer vegetable stage on high for around 6 hours. The vegetables will be soft. Serving suggestions. Sop up with a great loaf of crusty Italian bread or pour over cooked pasta of choice. Also great over white rice. What a wonderful recipe to showcase summer produce!!! Perfect light meal.